I commented a few times about the alleged fakes happening on Amazon - TL;DR: I've never had any issues and I'm very particular/observant about fake fragrances - Joop! Homme was reformulated a few years back - and, this fragrance doesn't come cellophaned, as new..unless that's changed very recently. New one from boots comes with cellaphane wrap and from superdrug. Just go have a look in boots at the counters. They're are plenty of reviews on amazon that say it's fake. 17% of them which is a high number. New one from boots comes with cellaphane wrap and from superdrug. Just go …New one from boots comes with cellaphane wrap and from superdrug. Just go have a look in boots at the counters. They're are plenty of reviews on amazon that say it's fake. 17% of them which is a high number. Like I say, many don't specify if they're third party sellers (which is akin to buying from ebay or even Gumtree) and my experience of Amazon has been excellent - I've bought lots from there. So how much of the "17%" is third party? Didn't know about the cellophane wrap, mine didn't have it, but it's definitely real, it is/was typical of this scent's packaging, and it was from Amazon themselves. I think most of you probably know the pointers of fake scent - cloudy liquid, a too-thick spray tube, print irregularities on the box/bottle, a bottle that's asymmetrical or badly finished, a spray cap that doesn't fit, most perfumes have a batch number that should match on the box and bottle. Fakes often look as if they've "been in the wars" from new, as well. If you put in fifteen minutes of your time on Fragrantica Forums and share pictures, you would know for sure. Also Joop! Homme has been reformulated in recent years - I added a thread from Basenotes above (from February 2015), that specifies what changed. 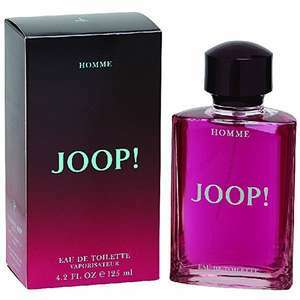 The most obvious thing that changed was "the newest version of Joop! has the 'Homme' underneath 'Joop!' instead of at the top of the bottle". I've never bought a fragrance on the internet but the idea that Amazon source fakes is ridiculous. Unfortunately they allow any old sh*t through the marketplace, and that's especially true of batteries and headphones, and will even package ("fulfil") the old sh*t in Amazon boxes but as long as you're buying directly from Amazon I maintain it can't be fake. I cannot understand why Amazon don't force reviewers to state whether they are reviewing Marketplace products or directly sold products. Boots and Superdrug tend not to have their (more expensive) scents on the shelves, so I'm not sure how you're definite that they're cellophaned - I'm guessing you've purchased from both? I've never bought a fragrance on the internet but the idea that Amazon …I've never bought a fragrance on the internet but the idea that Amazon source fakes is ridiculous. Unfortunately they allow any old sh*t through the marketplace, and that's especially true of batteries and headphones, and will even package ("fulfil") the old sh*t in Amazon boxes but as long as you're buying directly from Amazon I maintain it can't be fake.I cannot understand why Amazon don't force reviewers to state whether they are reviewing Marketplace products or directly sold products. Amazon Warehouse is notorious for "switcheroos" as well Had it happen to me a few times, sad to say. Not fragrances - yet - touch wood. Switcheroo syndrome on Amazon Warehouse doesn't apply just to fragrances - happened recently with a pot of moisturiser boxed and sealed (though I only noticed the tiny slither of sellotape when I got round to opening it - someone put a half-used jar of Cajun Spices in the box!!). I've heard of people receiving lesser graphics cards in GTX 1080 boxes from Amazon Warehouse, etc, too.